1959LF-AR is rated 4.9 out of 5 by 27. 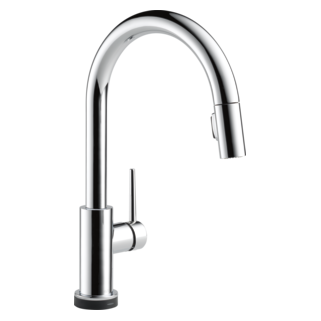 Rated 5 out of 5 by MimiMcFad from Looks Good and Works Well I needed a new faucet and matching beverage faucet. My prior faucet had a built in water filter. My challenge was finding the two faucets that match. They both are perfect and we're very happy with them. Our plumber recommended Delta saying as a plumber he thinks they're a good product and if repairs are needed parts are readily available. Rated 5 out of 5 by georgia from looks very good and function perfectly Looks very good, easy to keep clean and function perfectly. I did not instal myself. Rated 5 out of 5 by Jillian from Clean, Elegant and Well Priced. I am using this for a laundry room. I love the clean look of the single spot and the elegant design. I will definitely use this faucet for another project in the future. Rated 5 out of 5 by Helen from Elegant! Very elegant, simple design. It has worked well and looks great! We are very happy! what type of rough plumbing do I need to purchase with this faucet? Need to supply builder with rough plumbing but not sure what provide for this one. Can you advise? 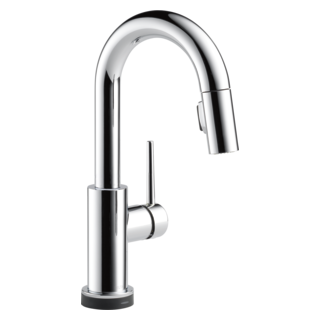 what is the thickness of the spout? 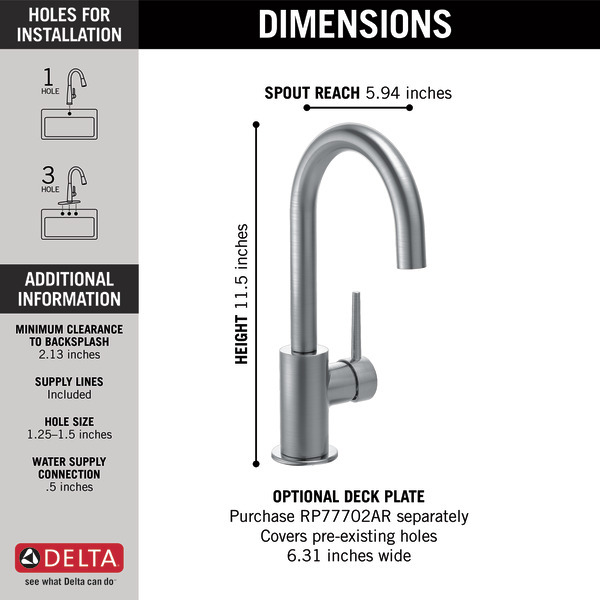 is it thinner than the standard sink faucet which has a pull down? 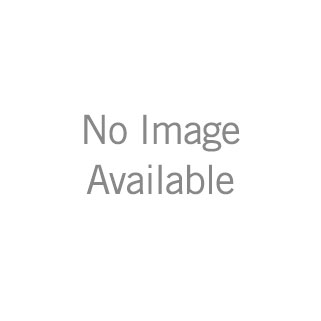 Hello MB, Thanks for your question. 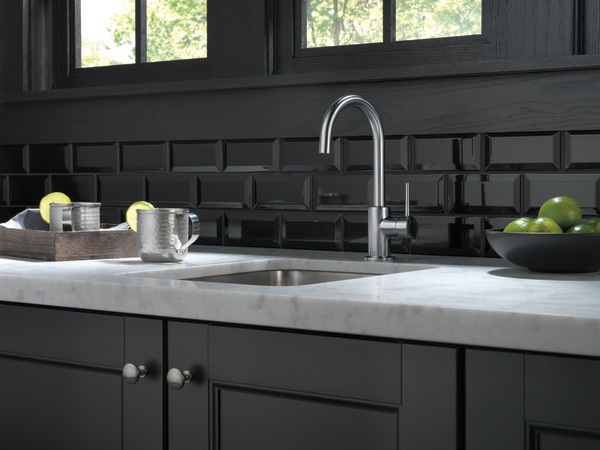 Generally speaking, bar/prep faucets are smaller than standard kitchen faucets as they are primarily used in smaller side sinks. 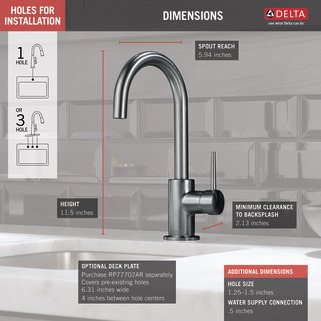 Here is the Technical Specifications of the faucet. This should give you an idea of the size of it: http://www.deltafaucet.com/customersupport/documentation/1959lf.html?document=ts&amp;fromDetailArea=kitchen&amp;documentIndex=0#flashWrapper I hope this helps! I need both the kitchen sink and the wet bar sink. Which one is this? Is there a 10-12 inch long eschutcheon that can be paired with the 1959LF-AR? Thanks so much! Which thick deck mounting kit? Hello, I am ordering this bar faucet and also have the bigger one hole trinsic kitchen faucet and soap dispenser. Which thick mounting kits should I use for all three? Thank you! 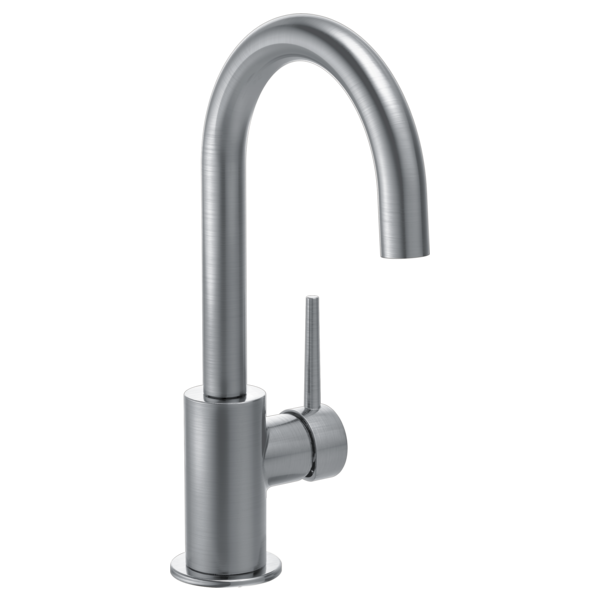 Is this Arctic Stainless the same color/finish as the Spotshield Stainless Finish of the regular sink faucet just like it only with pull down? 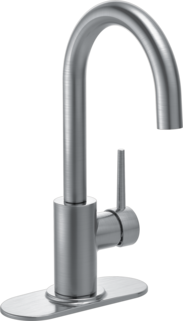 Can this faucet be installed with the control lever on the left side, rather than the right as shown?